Now that I am starting to eat healthy (and I hope it sticks this time), I am starting to open my eyes to something that never even occurred to me before. Why am I so fat? I mean, when I was a kid, I ate the same things that I eat today and I wasn’t fat then, so why now? It’s not an overeating issue because I can eat a healthy portion and yet I can’t lose weight easily. Well, now that I am eating healthy non processed foods, I am finally starting to lose weight. Why is that? Here’s the thing. We’re all hearing all this stuff in the news about what they (food producers) use to make and preserve all of the food that they sell and all of the pesticides that go into the plants (corn) that they use to preserve and sweeten our food. What is a pesticide? It’s a poison. We are knowingly or unknowingly putting poison into our bodies. Have you seen the size of chickens today compared to chickens 20 to 50 years ago? They were very tiny back then, now they are fat and they grow really fast. Why is that? Because they are injecting growth hormones into them to make them bigger. We are knowingly or unknowingly putting growth hormones into our bodies by eating those chickens. They are injecting those into the cows and turkeys too. Nothing is safe. I haven’t really done any research so I can’t verify everything I just said because I don’t know for a fact that that is what is happening. But it’s a good question as to why we are getting so fat all of a sudden compared to so many decades ago. Pardon me, let me adjust my tin foil hat… there, that’s better. What does that have to do with homemade peanut butter and strawberry jam? Here’s what. 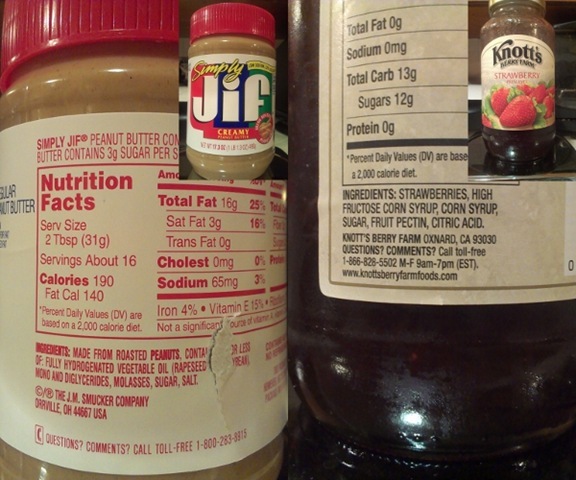 Look at the list of ingredients that are in a jar of Jif Creamy Peanut Butter and Knott’s Berry Farm Strawberry Preserves. I apologize that the Jif label is ripped conveniently on the part that I wanted you to read lol. It was already like that when I bought it and I have no idea what it says, but it doesn’t matter because it already has too many ingredients which proves my point. Let’s look at the ingredients though. Roasted peanuts, hydrogenated vegetable oil, mono and diglycerides, molasses, sugar and salt. What problem do I have with those ingredients? Well, for one, you can make your own homemade peanut butter if you have a food processor or a blender by simply blending a jar of unsalted planters peanuts until they are in chunks, then add 2 tablespoons of peanut oil, 1 tablespoon of salt and 2 tablespoons of molasses or brown sugar or whatever sweetener you want, or you don’t even need to add any sweetener if you don’t want to or if you are diabetic.. That’s all you need. You can add some cinnamon if you want, but that is totally up to you, but at least you know what you are eating. Watch this video for a tutorial on how to make it. Take a look at the ingredients in the strawberry jam. Strawberries, high fructose corn syrup, more corn syrup, sugar, fruit pectin and citric acid. You can make your own strawberry jam and even store some in your pantry if you follow the instructions in the video below. All she uses is strawberries, sugar, pectin and lemon juice which is your citric acid. That’s it. No high fructose corn syrup and more corn syrup. That is just so unnecessary. I am going to start making our own peanut butter and strawberry jam from now on. Have you seen the prices on those at the store? We don’t buy them too often because of how expensive they are. It only just occurred to me that I could probably make these things a lot cheaper, and now I see that is true. Of course I don’t plan on going crazy jarring food, but it doesn’t hurt to make a few jars of this and that every few months or whenever you run out of things. One of the homemade things I made recently is homemade applesauce. All I did was peeled an apple, chopped it up, put it in a little pan with a little bit of water and let it boil until the apple was soft. I crushed it and mixed some cinnamon and a tiny bit of brown sugar and viola, applesauce. You don’t even need to add the brown sugar because it’s sweet enough on its own, I just wanted the extra sweetness of the brown sugar. I am seriously considering buying a bag of apples so I can make many jars of applesauce to keep in the pantry. I don’t eat enough apples because I don’t particularly care for them in their solid form, but I do love applesauce. So there you have it. You can make your own healthy PB&J and it’s way cheaper than buying jars at the grocery store. Not only will you save a lot of money, but you know exactly what you are eating.